Mobile movie theatres or DigiPlexes have been launched for the movie buffs in rural parts of India. 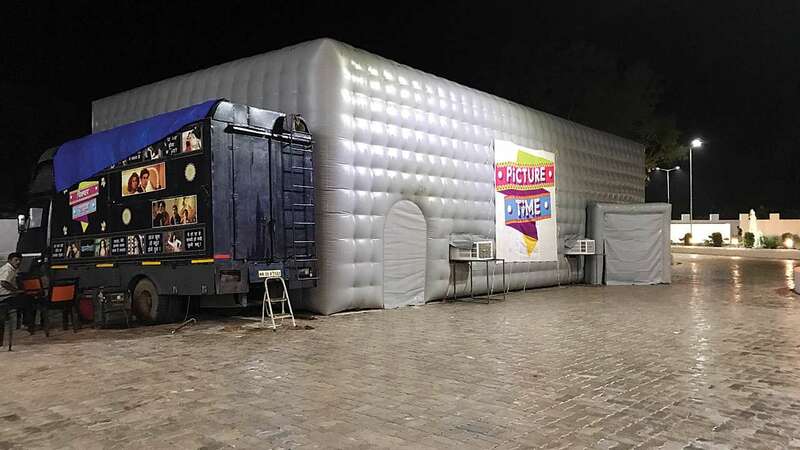 It is an innovative concept in which mobile theatre vans/ trucks are used for high-quality movie projection for just INR 30 per ticket. An inflatable canopy is set up which can comfortably accommodate close to 120 viewers. The set up uses the Internet of Things to reach out to the people of rural India. The platform also enables interaction of villagers with various government departments and thus create awareness about different schemes launched by the central and state governments. In fact, the platform was used to promote schemes like Pradhan Mantri Jan Dhan Yojana, Mudra Yojana, banking and other cashless programs. It can further be used to guide students in villages about different educational and career avenues. Since the mobile theatre vans are doing a great job in linking rural India with modern internet times, it would be great if the government could provide financial aid to these startups and help them go solar. These DigiPlexes are gaining momentum across the rural belts of India and could provide a good way to promote solar in rural India. It would be a good thing to power these trucks using solar energy. Solar panels can be installed on top of these trucks and could be stored for use during evenings or night shows. Solar is being increasingly promoted in the Indian transport industry, with railways adopting solar panels in a big way. In fact, the Indian government is also planning to run solar-powered trains in future. We have also heard about rickshaws, boats, and karts running on solar power in India. Using Solar power on these mobile movie theatres will not only reduce costs, pollution but will also be a good way of promoting solar energy in small towns and rural India, which could go a long way in supporting India’s 100 GW of solar installation target by 2022.